Published Apr 10, 2018 By Julia 120 CommentsThis post may contain affiliate links. 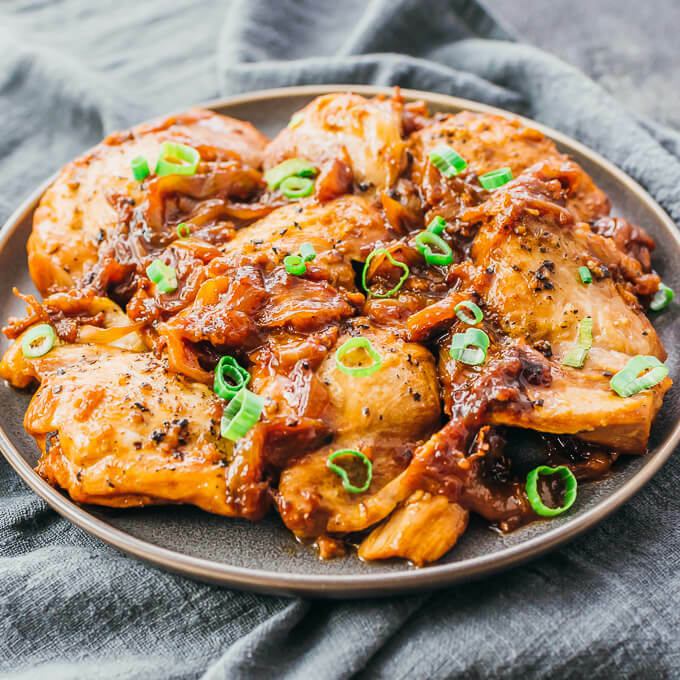 Chicken adobo is traditional Filipino comfort food made easy with a pressure cooker. The chicken comes out tender and flavorful, and the adobo sauce is simultaneously tangy, sweet, and savory. I don’t get the chance to eat Filipino food often, but this is one of my favorites! The main ingredients in chicken adobo are chicken thighs (I use boneless and skinless ones), onions, soy sauce, and vinegar. 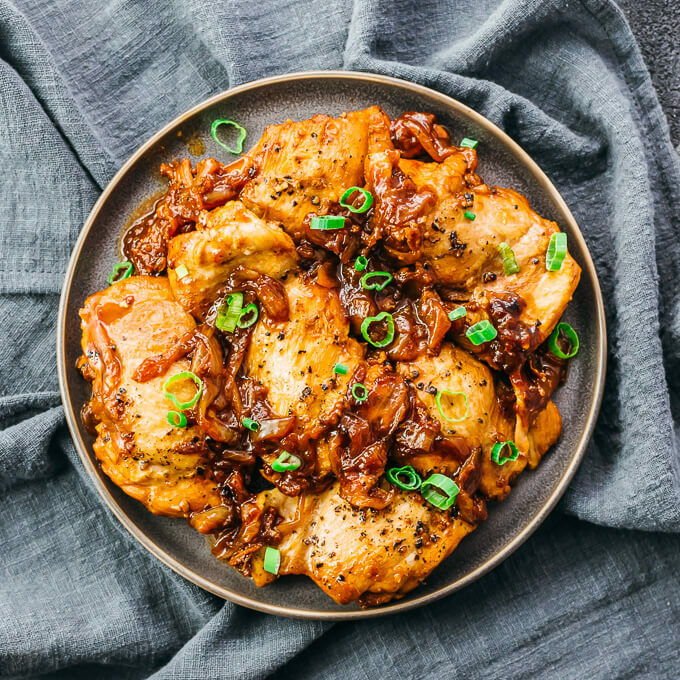 The chicken thighs are seasoned and pan seared, followed by pressure cooking with soy sauce, vinegar, and onions in the Instant Pot. The saute mode is then used to reduce the sauce to an almost sticky consistency. 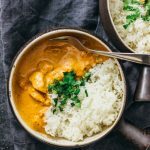 The adobo sauce is the highlight of this dish, so here are a few details regarding the last step when you’re reducing the sauce. The recipe recommends 15 minutes of boiling to be on the conservative side, but you can boil longer for a different result. 15 minutes then you’ll get a decent amount of remaining sauce to spoon over the chicken but it won’t be very thick. The sauce will, however, taste amazing with the onions and chicken. 20 minutes then you’ll end up with a thick glaze that easily sticks to the chicken. However, since it’s more of a glaze than a sauce, you won’t have much liquid to spoon over the chicken. You’ll also have to be careful that the sauce doesn’t burn on the bottom of your pressure cooker pot. Personally, I like the consistency of the sauce when boiled about 17 minutes. I recommend 15 minutes for most people because it’s easy to burn the sauce when it starts becoming glaze-like, but it’s up to you! The onions are a must and cannot be skipped. The sauce would have a very different taste and texture without them. If you follow the Paleo or Whole30 diet, you can substitute soy sauce with coconut aminos. I don’t recommend using chicken breasts. Use chicken thighs, legs, or drumsticks. I use boneless and skinless ones because it’s easier, but you don’t have to. 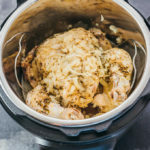 This recipe’s ingredients were a good amount for my 6 quart Instant Pot, but you can easily double them for an 8 quart pressure cooker. If you have any leftovers, they store well in the refrigerator and can be reheated the next day in the microwave. Select the saute mode on the pressure cooker for medium heat. Generously season chicken thighs on both sides with salt and pepper. When the display reads HOT, add olive oil to coat the bottom of the pot. Add half of the chicken thighs and cook for a few minutes on each side before transferring them to a plate. Repeat for the remaining chicken thighs. Turn off the saute mode. Add soy sauce, vinegar, onion, garlic, and cayenne to the pot. Stir well and scrape up any brown bits stuck to the bottom of the pot. 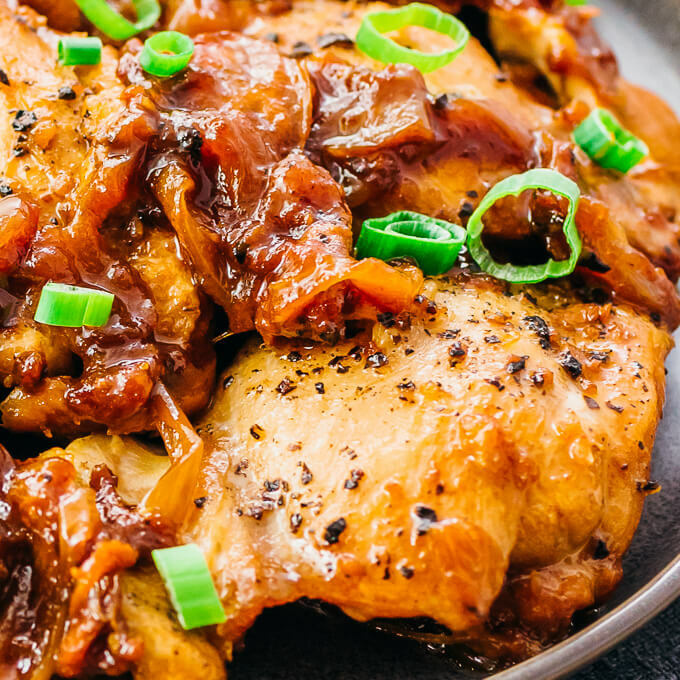 Return all chicken thighs to the pot in a single layer, placing them snugly on top of the onions. Top with bay leaves. Secure and seal the lid. Cook for 10 minutes at high pressure followed by a manual pressure release. Uncover and select the saute mode. Boil for about 15 minutes to thicken the sauce. Remove the bay leaves. 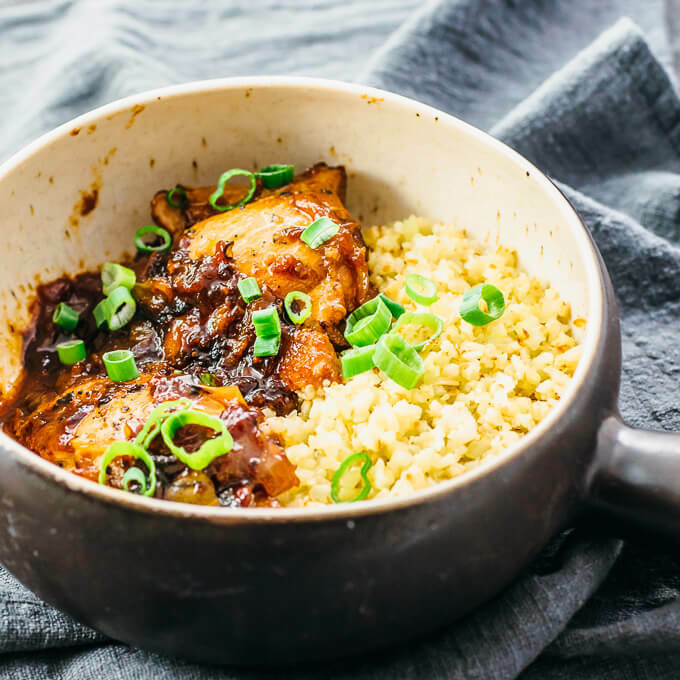 Serve the chicken and sauce, optionally with cooked cauliflower rice. Top with sliced scallions. 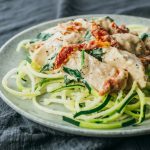 This recipe yields 6.5 g net carbs per serving. Nutrition information doesn't include serving ingredients like rice. 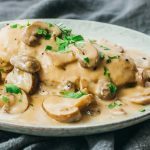 Can you make this in a 3qt instant pot? My question is about after pressure cooking, when boiling the sauce in Saute mode. Do you transfer the chicken out of the pot first? Or, do you leave the chicken in the pot during the boiling step? Thank you very much. You leave the chicken in. Let me know if you have any other questions, Kim. This is the second time I am making this. My family loves it! This was so good! Easy, quick, flavorful. Definitely will make it again. Thank you! My family loved this dish. Is it possible to double the recipe? Yes. Double the ingredients but keep the pressure cooking time the same. In some Instant Pot versions, it’s the Manual button. I recommend reading your Instant Pot’s manual to learn which button corresponds to pressure cooking. I’m making this tonight but only have regular soy not low sodium. What should I do? Cut it with water? I would use a mixture of regular soy sauce and water. Really yummy!! Served it with cauliflower fried rice. Since I had the food processor out already to chop the cauliflower, I also used it to quickly mince the garlic and slice the onion. Even if you chop & slice by hand, it’s still pretty quick to prep. Thanks again for a great recipe!! I have made this twice. It’s my husband’s favorite IP meal. The only change I made is I saute the onions after browning the chicken just to give them some depth and then deglaze with the liquid. I also remove the chicken before simmering in liquid after the NPR because I wasn’t sure whether to leave it in or not. It’s already falling apart so I would imagine it would fall apart even more if I left it sitting in the liquid. Served it over white rice or yellow with peas to mix in. Delicious! The instructions say manual pressure release not NPR. NPR will keep cooking it. Maybe that’s why yours was falling apart. Do manual right after the 10 mins and it’s perfect! I was confused about this too. Manual release is the same as quick release. Mine is very salty…do you think it’s because I used regular soy sauce? Yes. The recipe states that you should use low sodium soy sauce because otherwise it will be too salty. Even with low sodium soy sauce, this is probably too salty for someone on a low sodium diet. It’s just the nature of soy sauce. And just threw in the cauliflower rice during the last simmer process to thicken the sauce. Rice cooked and it’s absolutely delicious. Made it last night and everyone LOVED it. Already requested to make it again. Followed your recipe to the T.